FRANKLIN, Mass. – In a game that featured hectic action in the midfield and few chances from open play, Franklin got a huge double save and a pair of goals from set pieces to beat King Philip 2-0 in the mist on Wednesday night at Pisini Field, earning the Panthers their first two points in the league this season. Not surprisingly, the game started with the ball largely confined to the midfield area. It took nearly 15 minutes before either team would fashion a shot on goal and it was the Warriors who had the first good chance. Senior Anthony Bozza dropped deep into the space in front of the Franklin back line and played an inch-perfect through ball to John Cullen. Franklin goalie Jack Rudolph was quick off his line to cut down the angle and was able to block Cullen’s first chipped shot and then also get a hand to keep out the rebound. A minute later, KP had another go from the edge of the area with a low drive by junior Matthew Clarke, but Rudolph was able to get behind it and make the save. Franklin took its time getting into the game but soon was closing down all over the pitch, compressing the space and not giving KP much time on the ball, particularly outside backs Kevin Flynn and Matt Szczepanowski. The pressure eventually paid dividends when the Panthers earned a corner with a half hour gone in the match. Junior Donny Tappin played a cross into the center of the box and freshman defender Terry O’Neill nodded the ball down into the turf and over sprawling KP keeper Nick Beltramini. It was O’Neill’s second goal in as many games and he has already shown his worth on the defensive side too, forming a solid partnership with junior Sam Stowell. The Panthers added a second goal 12 minutes into the second half. A free kick from just inside the KP half by Stowell angled towards the edge of the box. Beltramini came a long way to get the ball, but senior Nick Barry rose highest and was able to get his head to the pass just before the keeper was able to punch. The brave flicked header doubled the Franklin lead, but Barry took a blow from the keeper in the process and was unable to return to the game. Beltramini kept the Warriors in the game down the stretch as Lucas Moura tested him with a one-timer following a turnover and another free kick was headed down by Jacob Cummings into the path of Sam Molloy, who forced a diving save from the KP keeper. The Warriors were struggling to create scoring opportunities for most of the second half. While the ball flowed through midfield, particularly through the feet of Zac White, the ball did not get to the forwards very often. KP did create a couple of chances late in the game to try and cut into the deficit. Sophomore Evan McEvoy fired a shot from long distance that drew a save from Rudoplph and then had another go from outside the box with two minutes to play, but it was also saved. Franklin (2-1-0, 1-1-0) will travel to Canton on Friday night, while King Philip (1-2-0, 1-1-0) will be on the road to face Milford. #5 Mansfield, 0 vs. #12 Braintree, 1 – Final – Braintree scored the lone goal of the game in the 33rd minute, eliminating the Hornets from the D1 South tournament. Mansfield keeper Nick Ferraz made 10 saves in net. #8 King Philip, 1 vs. #9 Natick, 0 – Final – King Philip senior Thomas Lugten was in the right spot at the right time, ripping a one-timer off a rebound to net the lone goal of the game and help the Warriors advance. In the 49th minute, junior Anthony Bozza attacked down the left side, cut it back and ripped a shot that bounced off the post. The rebound fell to Lugten just inside the 18 for his one-timer. King Philip advances to play top-seeded Brockton on Monday at 6:00. #7 Mansfield, 0 vs. #10 Marshfield, 2 – Final – Marshfield scored a pair of goals in the second half to land the upset on the road. Mansfield finishes the season 13-2-2. #8 North Attleboro, 2 vs. #9 Bishop Feehan, 2 – Final (North wins 3-2 in PKs) – North Attleboro junior goalie Emma Noreck turned away two penalty kicks and three Rocketeers converted their chances from the spot as Big Red denied an upset bid from the Shamrocks. Feehan took a lead on a penalty kick early in the first half but Kayla Pasquel netted an olimpico – scoring directly off a corner kick – with five minutes to play in the half to knot the score. Feehan regained the lead in the 55th minute but Haley Guertin had an answer, finding the back of the net out of a scrum off a service from Pasquel. After two scoreless overtime periods, the teams went to PKs. Noreck made saves on Feehan’s first and fifth shots while Pasquel, Aine Mendonca and Ashlyn Gaulin scored from the spot. NAHS head coach Bill Wallace added Leah Jette, Emma Gaulin and Felicity Monfils played great and Sam Hawkins was outstanding, shutting down Feehan’s leading scorer. #2 King Philip, 3 vs. #18 Franklin, 2 – Final (2OT) – Click here for a recap and photo gallery of this game. #4 Canton, 2 vs. #13 Dartmouth, 1 – Final – Senior Andrea McNeil opened the scoring early on to give the Bulldogs the lead but Canton needed a late-winner to fend off an upset bid by the Indians. McNeil scored just a minute into the contest but Dartmouth knotted the score with 18 minutes left to play. Sophomore Kaitlyn Goyetch netted the game-winner off of a corner with 2:09 left. Attleboro, 0 @ Mansfield, 3 – Final – Click here for a recap of this game. Foxboro, 2 @ Stoughton, 0 – Final – Foxboro scored a pair of goals in the first half and earned its eighth shutout of the season with a win at Stoughton. Shane VandenBoom scored a goal and had an assist to pace the Warriors. Ryan Kelley also scored while junior Matt Garcia had an assist. Franklin, 2 @ Taunton, 0 – Final – Click here for a recap of this game. Oliver Ames, 1 @ King Philip, 1 – Final – Oliver Ames scored just over midway through the first half but King Philip equalized early in the second half as the teams each took a point. Senior James Gillespie finished off a long throw from Chris Lawrence to put OA head 1-0 in the 22nd minutes. King Philip tied it in the 48th minute when Connor Mullins scored on an assist from Anthony Bozza. Sharon, 1 @ North Attleboro, 3 – Final – North Attleboro worked its way to a 2-0 lead by halftime and added a late insurance goal to pick up two points against visiting Sharon. Senior Gabe Pinhancos intercepted a pass and opened the scoring in the 16th minute for the Rocketeers. Then just before half, sophomore Dylan Corrigan played junior Joe Hilf in behind the defense and Hilf scored to make it 2-0. Sharon cut the deficit to one in the 62nd minute when sophomore Michael Baur converted a free kick from just outside the area. But North iced the game when Pinhancos drew a penalty kick and Hilf converted in the 66th minute. Mansfield, 5 @ Attleboro, 0 – Final – Mansfield juniors Steph Kemp and Sydney Mulkern each scored a pair of goals while Cassidy McMahon also registered two points with a goal and assist as the Hornets rolled on the road. Allie Reef, Amanda Mangano, Emma Oldow and Kemp each finished with one assist. Stoughton, 0 @ Foxboro, 6 – Final – Foxboro’s offense netted four goals in the second half to break the game open, earn two points, and qualify for the state tournament. Junior Mackenzi Fraser and sophomore Lizzy Davis each scored two goals in the win while senior Lily Sykes finished with two assists. Kendra Wentling converted a penalty kick and Katelyn Mollica also found the back of the net in the Warriors’ win. Taunton, 0 @ Franklin, 1 – Final – Anna Balkus scored the game’s only goal midway through the second half to give the Panthers a narrow win and a sweep of the season series. Grace Pimenta made 13 saves in defeat for the Tigers. King Philip, 3 @ Oliver Ames, 0 – Final – King Philip scored once in the first half and added two goals in the second half to avenge its lone loss of the season with a win at OA. Ally Stanton opened the scoring in the 36th minute, one-timing a cross from Makayla Griffin. Griffin grabbed her second assist in the 69th minute when she picked out sophomore Avery Snead for a header. Snead then iced the game with her second goal four minutes later, heading in a corner from Emma Cocoran. OA coach Britt Sellmayer said that Sophia Cox and Regan Benton played well for the Tigers. North Attleboro, 2 @ Sharon, 1 – Final – Sharon’s Fallon Pfeifer put the Eagles ahead but North Attleboro scored once in each half to earn the win. Emma Gaulin tied the game in the first half, converting a feed from MacKenzie Rosenberg. North’s Ashlyn Gaulin netted the game-winning off a corner kick in the second half for the game-winner. Attleboro, 161 vs. Dighton-Rehoboth, 169 – Final – Attleboro moved within one win of qualifying for the state tournament with a non-league win over visiting Dighton-Rehoboth. Kyle DelSignore earned match medalist honors for the second straight match, firing a 39 for the Bombardiers. Ethan Johnson carded a 40 while Jack Handy and Brian Houle each shot 41 for Attleboro. North Attleboro, 158 @ Canton, 148 – Final – Canton’s Joey Vaughan fired a low-round of 35, earning medalist honors to lead the Bulldogs over North Attleboro. The win sets up a showdown with Oliver Ames for a battle of unbeatens. Tommy Dimock and Thomas Singleton each shot 37 for Canton while Dylan Kane carded a round of 37 to lead the Rocketeers. Oliver Ames, 165 @ Taunton, 178 – Final – Oliver Ames picked up a win over Taunton to set up a showdown of undefeated teams on Wednesday when the Tigers host Canton. Tate Hadges earned medalist honors, carding a low-round of 39. Ryan McGarry shot 40 for the Tigers, Nolan Donze carded a round of 41 and sophomore Kyle Gramer fired a 45. Milford, 3 @ Canton, 4 – Final – Canton junior Paul Cocoran netted his second hat trick of the season, including a pair of goals in the second half that helped the Bulldogs build a three-goal lead. Milford opened the scoring when freshman Leo Coelho netted his first career goal but Canton responded with a pair of goals in a two-minute span. Corcoran tied the game in the 21st minute and Simon Cruz gave Canton the lead in the 22nd minute. Cocoran added goals in the 56th and 64th minutes to go up 4-1. Milford sophomore Jordan Borges made it a two-goal game in the 75th minute and sophomore Walisson de Oliveira brought the Hawks within one in the final minute. King Philip, 5 vs. Bishop Feehan, 1 – Final – King Philip scored four goals in the second half to break a tie game and pick up two points at home. Tyler Mann put the Warriors up 1-0 on an unassisted tally in the ninth minute. Feehan tied the game midway through the first half. Mann completed his hat trick with a pair of goals in the first 10 minutes of the second half, making it 2-1 in the 44th minute on a feed from Anthony Bozza and 3-1 just two minutes later on a feed from Connor Mullins. Thomas Lugten scored a pair of goals in a five-minute span, with junior Justin Willson and freshman Evan McEvoy picking up assists. Stoughton, 2 vs. Norwood, 1 – Final – Tyler Melo and Fabio Ponce de Leon each had a goal for the Black Knights to earn Stoughton its first win of the season. Milford, 0 @ Canton, 3 – Final – Click here for a recap and photo gallery from this game. Stoughton, 3 @ Norwood, 4 – Final – Chinazo Odunze scored a pair of goals and Mackenzie Manning had a goal and an assist for the Black Knights. Brigid Pearl and Nicole Weir also had assists in the loss. King Philip, 6 @ Attleboro, 0 – Final – King Philip junior Alli Meehan recorded a hat trick to pace the Warriors on the road. Senior Christina Hathaway netted a pair of goals and Dana Truini scored once for King Philip. Sharon, 0 @ Foxboro, 9 – Final – Sophia DiCenso led the way for the Warriors with a hat trick. Jackie Brion, Molly Murphy, Lily Daly, Annie Murphy, Lindsey Morris, and Lily Behn also scored for Foxboro. Oliver Ames, 0 @ Franklin, 2 – Final – Franklin junior Anna Jardine had a strong game in net, making nine saves, including a gutsy slide tackle and a beautiful diving save – both in the second half – to help the Panthers preserve the win. Juniors Cassi Ronan and Regan Paterson each scored once in the first half for Franklin. FHS head coach Lisa Cropper said junior Annie Walsh played an outstanding game, creating numerous offensive chances and stopping OA from mounting an attack. Oliver Ames goalie Caitlin Grant made eight saves in net. Mansfield, 1 @ Taunton, 3 – Final – Senior Kya Enos netted a hat trick for the second straight game and junior goalie Emma Sheehan made 12 saves to help the Tigers earn an upset over visiting Taunton. Diana Brens had two assists while Liana Duarte had one helper in the win. THS coach Mike Fox praised the defensive play of Jillian Pagliuca, Jocelyn Pagliuca, and Kathryn Robinson. Milford, 1 @ Stoughton, 2 – Final – Stoughton’s Haley Apotheker scored a pair of goals to help the Black Knights defend its home field and earn a win over visiting Milford. Canton, 0 @ Milford, 3 – Final – Milford picked up a key division win at home, taking it 25-19, 25-18, 25-23. For Canton, Taylor Harris and Hannah Jerrier combined for 14 kills while head coach Pat Cawley praised the defensive play of Julia Minichiello. Foxboro, 0 @ Stoughton, 3 – Final – Stoughton earned a dominant win in the first game but had to orchestrate a comeback to win a close second game. The Black Knights completed the sweep with a convincing third game win, 25-5, 26-24, 25-10. Val Whalen took control in the first set, rattling off 16 service points, including six aces. Sophomore Mykiah Simpson paced the offense with five kills in the opening set. Whalen finished 16 kills, 18 digs, and eight aces while junior Molly Turner added 21 assists and six aces. Seniors Vicky Ramos and Haley Stone played well defensively for the Knights. 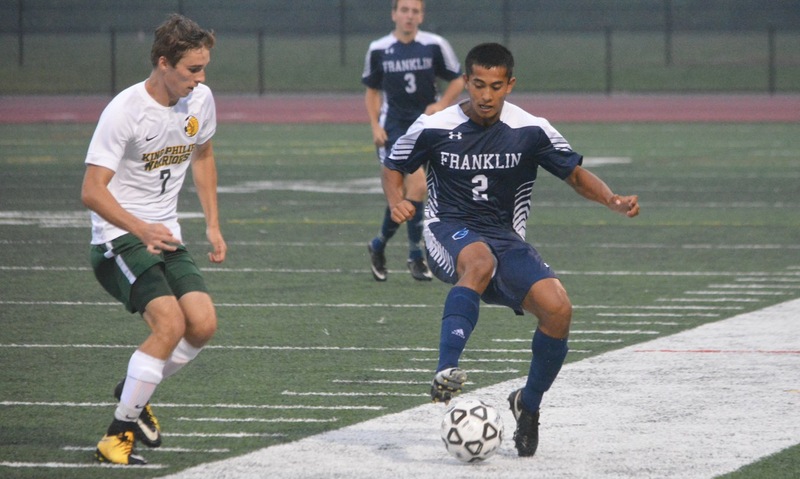 Franklin, 3 @ Taunton, 0 – Final – Franklin mounted a late comeback in the second half to help sweep the Tigers on the road. Junior Lauren McGrath (four aces) put the Franklin offense in motion with 30 assists while Meaghan Maguire had 10 kills and two blocks and Lauren Lockhart chipped in with eight kills. Click here for a Photo Gallery from this game. Sharon, 0 @ North Attleboro, 3 – Final – North Attleboro earned the sweep, defeating Sharon 25-14, 25-20, 25-12. Seniors Amelia Murphy (13 kills) and Kezie De La Cruz (nine kills) led the Rocketeers to the win. Oliver Ames, 0 @ King Philip, 3 – Final – King Philip defended home court with a convincing 25-14, 25-11, 25-14 win. Sydney Phillips led the way with 15 kills while Michaela Palumbo added four kills. Julianna Rando (eight digs) and Elise Pereira (seven digs) paced the Warriors’ defensive effort. Taunton, 179 @ Attleboro, 174 – Final – Attleboro’s Kyle DelSignore eached match medalst honors with a low-round of 39 and was the difference between the Bombardiers and Tigers. The two teams matched on cards two, three and four – meaning DelSignore’s five-stroke win on the top card was the difference. Canton, 157 @ Mansfield, 173 – Final – Canton sophomore Chris Lavoie fired a 36 at Norton Country Club, earning match medalist honors for the first time and helping the Bulldogs stay unbeaten. Danny Powers added a 39 for the Bulldogs while Brendan Loomer led Manfield with a round of 40. Stoughton, 174 @ Oliver Ames, 139 – Final – Oliver Ames senior Mark Bissonette birdied the first two holes of play, finishing with a low-round of 33 to earn medalist honors. Ryan McGarry and Eric LeBlanc added rounds of 35 while Matt Kelley fired a 36 at Pine Oaks. Even though Attleboro graduated some key pieces, the Bombardiers have a lot of experienced and talented players back for the 2017 season. The biggest challenge will be replacing center backs Harry Lancaster (Best XI selection) and Tyler Treichler (Second XI selection) in the heart of the defense. Juniors Colin Levis and Aidan Lancaster are both back on the defensive line after gaining plenty of experience a season ago. They’ll look to work with Brandon Lewis and Connor Dunn to solidify the back four in front senior goalie Nick Hasenfus (2016 Best XI selection). In the midfield, Zach White is back and will be relied upon as one of the team’s top playmakers once healthy. He’ll have the help of Brady Holander, Nathan LaPlume, Devin Andre, Eli Araujo and Keith Thompson. After breaking out as one of the league’s bright young stars a season ago, Will Halben is back to lead the attack alongside sophomores Mike Russo and David Medeiros. “We are hoping to do a bit better than last year with a bit more depth,” said Attleboro head coach Peter Pereira. It looks like there is a chance of growing pains in the forecast for the 2017 Panthers. After graduating over a dozen seniors from last year’s team, there will be some inexperience in the lineup for Fran Bositis. Senior Freddie Beckmann returns as the team’s starting goalie to give the defensive end some familiarity, but it will be a brand new back four in front of him. Sophomore Sam Stowell saw some minutes a year ago and will anchor the defense alongside senior Andrew DiLeo. Senior Connor O’Rourke, who also played some last year, will man the outside along with junior Sam Malloy. In the midfield, Nitin Chaudhury will take over as the holding mid in the center of the pitch but could also move around depending on need. He’ll have the help of sophomores Jacob Cummings and Donny Tappin. Up front, there are mainutes up for grabs with junior Tim Duval in the running to likely grab one of the spots. It will be hard to top the historic season the Warriors had a year ago, winning the division title and allowing just eight goals all season. But Nick Gale and his squad are focused on 2017, not last Fall. Even though 2016 Best XI selections Cam Mullin and Colby Koch, and Second XI selections Ryan Coulter and Eli O’Neill all graduated, the Warriors still return some of the top talent in the league this year. Tyler Mann, the 2016 HockomockSports.com Player of the Year, is just one of many talented players back for Gale. Senior Connor Mullins will be a key piece in the midfield, senior Larsen Keys started all of last year on the back line and senior Mike Rowe is a dangerous player inside the 18. Thomas Lugten, Anthony Bozza and Zac White are all back as well after playing plenty of minutes last year. Junior Nick Beltramini and sophomore Tristan Stephani are battling for minutes in goal. “Our focus continues to be on developing players and improving our team,” Gale said. “We understand that opposing teams will be after us, but we won’t take our attention away from training, competing, and focusing on the smaller details that will help us continue to move forward. The league will be good, and we know we will need to be as well. Mansfield will be relying on a mix of experience and new faces in an effort to get back to the postseason for another year. The Hornets have the challenge of trying to fill the shoes of two-time Best XI selection Max Gurnon, and as well as the void left by the injury to Ethan Brill-Cass, a two year varsity starter. However, with Sean Lanzillo, Nick Hyland, Sam Hyland and Harry Braidt back, the Hornets have a solid core to work on. Lanzillo’s speed makes him one of the toughest marks in the league while Sam Hyland emerged as a top midfielder last season. Nick Hyland and Braidt will be back to anchor the back line. Head coach Steve Sheridan expects junior Sam Nugent to step in and make an impact early on defensively, as well as junior midfield Luke Savoie on the offensive end. Senior Nick Ferraz is battling with sophomore Anthony Salisbury for the starting position in net. “I’m hoping some of the younger guys can step up on offense, and with the departure of Max along with the injury to Ethan and graduation of Jed in goal, our defense is going to have some new faces,” said Mansfield head coach Steve Sheridan. Oliver Ames returns plenty of talent and will be looking to challenge King Philip for supremacy in the Kelley-Rex division. Two-time HockomockSports.com Best XI selection Nathaniel Cardoza is back to anchor the Tigers from the middle of the field. His ability to play defense, as well as get forward, gives OA a boost. Other returning starters back this year include Matt Campbell, Matt Alvarado, Cam Vella, Mason Galbato and Jack Sheldon. Mike Braga and Chris Lawrence bring experience to the back line in front keeper Jack Carroll, who is in his third year in net. With the graduation of three-year starter Thomas McCormick, the Tigers have a void to fill at the striker position. Senior James Gillespie saw time last year off the bench and proved a capable option up top while Alvarado also showed his ability to finish. Senior Brandin Osborne transferred in from Coyle and will also be an attacking option for OA. Nick Bloumbas, Sean Flaherty and Niko Byron will all likely see time off this season as well. Taunton brings back eight starters from last year’s team and head coach Taylor Whitters is hoping that experience will translate into an improved season in 2017. On top of of those eight starters, the Tigers will have Marc deSousa back in net after a missing his junior season battling cancer. Senior Liam Crowley is back again with more experience to anchor the back line along with junior Kyle Aubin. DaeShawn Duffie and Hasan Farahat both return to give the Tigers a solid duo in the middle of the pitch while junior Liam Crowley also adds experience to the midfield. Jake DeAndrade, Brett Beaulieu and Alec Nunes are also back in the mix this year as well. The Tigers got a boost from their rival as Ian Soderbom traded his Warrior blue and gold in from Coyle for Tiger black and orange. Soderbom will be a key piece on defense while Francois Hennaux, an exchange student from Belgium, will add depth to Taunton’s offense. WRENTHAM, Mass. – It was a tale of two halves between top seeded King Philip and ninth seeded BC High at Mactaz Field on Monday evening. 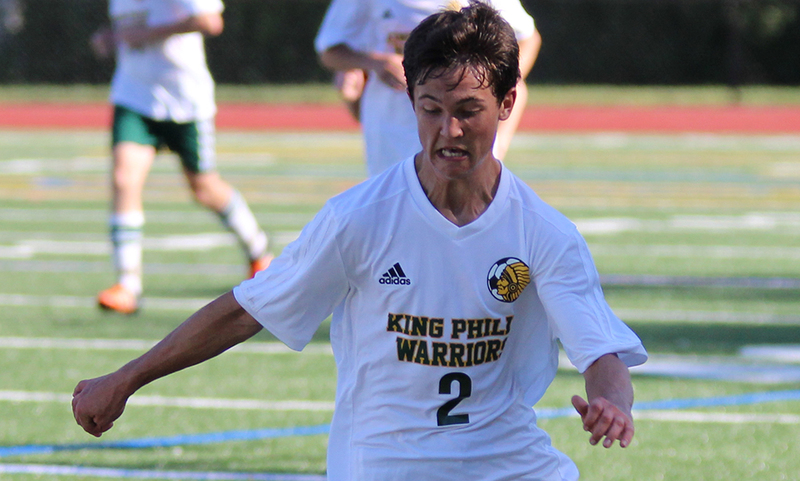 The difference ended up being the Warriors converting in the half they had the majority of control while its defense kept the Eagles at bay when the visitors dictated the pace; King Philip picking up a 1-0 decision in the D1 South Quarterfinals. “We struggled to score a little bit today but you expect a battle at this point in the season,” King Philip head coach Nick Gale said. “I think if a couple of those went in, we would have been better off but I have a lot of respect for BC High. They are a good program historically and they were a good program again this year. King Philip was in control from the opening whistle, notching a pair of serious scoring chances in the first 20 minutes of the game and adding good looks on a pair of corner kicks. In the sixth minute, Larsen Keys and Anthony Bozza connected with a one-two sequence before Keys delivered a service into the area. Thomas Lugten rose up and met the cross with his head, forcing BC High keeper Mike Ball to leap and tip the ball just over the bar. In the 15th minute, Bozza served in a corner that senior Cam Mullins jumped up to meet, nodding his header towards the near post but Ball was quick to get down and make the stop. In the 28th minute, senior Colby Koch did well to get some space from his defender, took a touch to his left and hit a low shot that was deflected but Ball did well to recover and make the diving save. Finally, after a handful of early chances, the Warriors were able to break through just before the half hour mark. The ball bounced out to the top of the area in front of Lugten and he connected on a volley. The ball hit the bottom of a BC High defender who had jumped to block the shot. That deflection put the ball right inside the far post, sneaking under Ball to put KP up 1-0. The Warriors were unable to find a second before the halftime break. From the opening whistle of the second half, the Eagles seized control of the game. Using a kick and run direct style of play, BC High tried to expose a weakness in KP’s defense but were unable to. “We made defense a priority today because we’re going to have to be a good defensive team to keep good opponents from scoring goals,” Gale said. “We tried to create as many transitional opportunities by winning the ball back quickly. Defense was definitely a priority. King Philip’s defense was strong in the air, continually clearing away long balls from the Eagles. The Warriors did have some chances in the second half, but Ball was fantastic in net for BC High. In the 58th minute, a long throw fell to the feet of Koch, who was on the edge of the six yard box. Koch tried to turn and shoot but Ball made the save in close. In the 60th minute, Keys flashed a header just wide off a corner kick from Bozza. BC High finally had a service sneak through King Philip’s defense in the 63rd minute but Warrior goalie Eli O’Neill was quick off his line and gobbled the loose ball before an Eagle could get a touch. Mike Rowe made a nice cut inside the area to get free in the 67th minute but his shot was denied by Ball. The rebound fell to the feet of Koch but he was unable to get around it before BC High cleared it. As the final minutes ticked away, BC High pushed number forward, allowing KP to get off on a break. Tyler Mann fed Koch in alone on goal. Koch did well to wait for Ball to make his slide and tried to elevate the ball over the keeper but an impressive one hand saved knocked the ball down. The rebound fell to Koch but before he could slot it in, Ball dove back into position and handled the follow up. Seconds after Ball’s double save, it looked as though BC High had found the equalizer. After a service was cleared out, the Eagles dropped another ball back in behind the defense. The ball deflected its way to a wide open Ryan Cuozzo behind the defense, who buried the ball at the far post but the refs whistled for offsides. KP was able to kill off the last minute without another threat. “It was a little frustrating at times but I told the guys they had to be disciplined,” Gale said. “At this point in the tournament, it’s going to be frustrating sometimes, you’re not going to win every single battle. It’s important to continue to make sure your disciplined in what has brought you success all season long. King Philip boys soccer (17-1-2) advances to the D1 South Semifinal to take on #4 Braintree on Wednesday at 5:30 at Brockton High School. The Wamps beat Attleboro 2-1 on a goal late in the game to reach the semifinal. WRENTHAM, Mass. 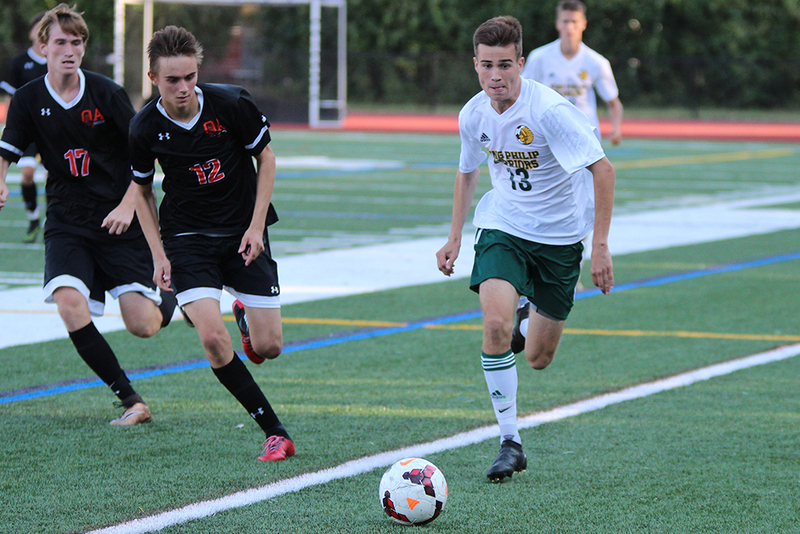 – King Philip boys soccer has scored in a variety of ways throughout the 2016 season. From free kicks to corner kicks, and in the run of play, the Warriors have crafted some impressive goals this year. But the Warriors saved their best goal for the most important game of the season. 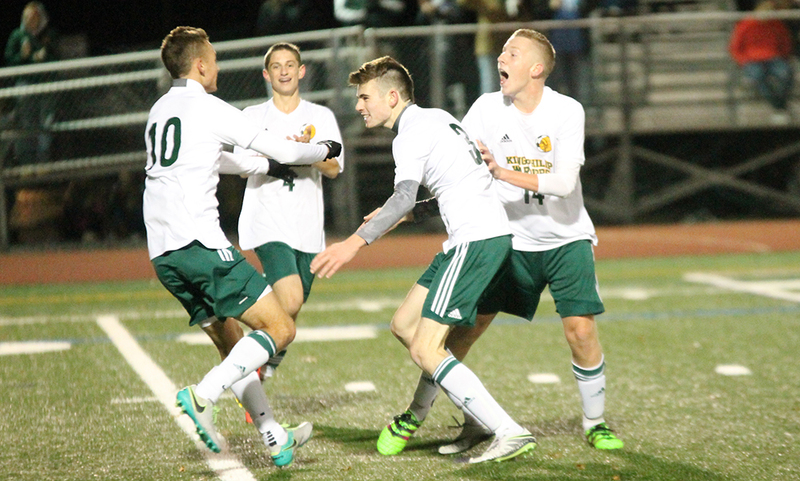 Senior Colby Koch uncorked an absolute stunner just moments before halftime that proved to be the game-winner in King Philip’s 2-0 win over Mansfield – a victory that clinched the Warriors’ first ever outright league title and first Kelley-Rex crown since 2010. The Warriors entered the game with a three point lead in the division over Mansfield and came out with the better of chances early on. Junior Tyler Mann intercepted a clearance from the Hornets and quickly found Koch for a shot just outside the area but Mansfield keeper Jed Tolbert did well to time his jump for the save. Five minutes later, Jack Bush’s long throw was deflected to the back post where KP sophomore Anthony Bozza latched onto it but his shot was blocked wide. In the 33rd minute, Larsen Keys cleared a Mansfield free kick and Mann quickly sent Koch forward. The senior connected with Nils van den Boogaard for a shot from just outside the area but Tolbert was positioned well for the stop. Mansfield finally registered its first serious scoring chance in the 36th minute when Cullin Anastasia was able to win a 50/50 ball, putting it down for a shot from Sam Hyland from just outside the area but KP keeper Eli O’Neill smothered the low shot. Just a minute before halftime is when the fireworks finally went off. Koch gained possession in the attacking third. A couple of touches forward, Koch was given just enough space the the senior didn’t hesitate, unleashing a shot from just a couple of steps over 30 yards out that ripped through the air to the upper corner at the far post to put the Warriors up 1-0. “Everyone was just making incredible runs, when I had the ball I was going to try and find Tyler on a run but the defender angled his body so I couldn’t,” Koch said. “I faked it, the defender went right, I went left and the goalie shifted so I just shot to the far post. The goal gave the Warriors the momentum heading into the break but KP couldn’t break through Mansfield’s defense and capitalize to start the second half. Mansfield had the first chance of the second stanza in the 55th minute when James Chotkowski hit an off-balance shot inside the area but it curled high and wide. Four minutes later, KP had a chance to double the lead by was stuffed by Mansfield captain Max Gurnon. Mann found Koch, who returned the pass but the shot from Mann in the area was blocked by Gurnon. Two minutes later, the Hornets nearly used their bread and butter – set pieces – to cash in and tie the game. A free kick from Gurnon dropped into the area, met by sliding O’Neill but the ball bounced loose in the area. Anastasia had a go on the rebound but his chance was blocked away. Mansfield had another bid in the 64th minute to try and tie the game when Hyland dropped a free kick to the far post but Gurnon was well marked and couldn’t get a clean touch. King Philip secured the win in the 79th minute as Thomas Lugten gained some separation on the left wing, firing a shot that Tolbert got a piece of. The rebound rolled to the far post where Mann sprinted onto it and buried it from in close to make it 2-0. “Nothing, we just can’t score on them,” Mansfield coach Steve Sheridan said when asked what it is about KP that gives the Hornets trouble. Mansfield’s lone two losses are to KP. “We played them tough. We had one mistake on that first goal, we let Colby get away and get the shot off…it was a beautiful goal, just a beautiful goal. We were pressing up at the end, we went with three forwards, four forwards. We were going for the tie and then we wanted the win, it just didn’t happen. With the win, King Philip moves to 15-1-2 overall and 13-1-1 in league play, which clinched the league title. King Philip boys soccer closes the regular season when Franklin comes to Macktaz Field on Thursday at 3:45. Mansfield has two games left in the regular season, first a visit from OA on Thursday and then a date with Canton at Gillette Stadium on Friday at 6:00.